Eco-conscious designer Natsumi Nishizumi’s onesies, hats and tees feature simplistically sweet bunny drawings appropriate for Easter or anytime. Each piece in the collection starts with the blank canvas of an American Apparel organic cotton basic. Then Natsumi uses water-based ink to hand-screen print her art. Another plus: 5% of the profits go toward an organization that helps provide medical care to Cambodia’s children. 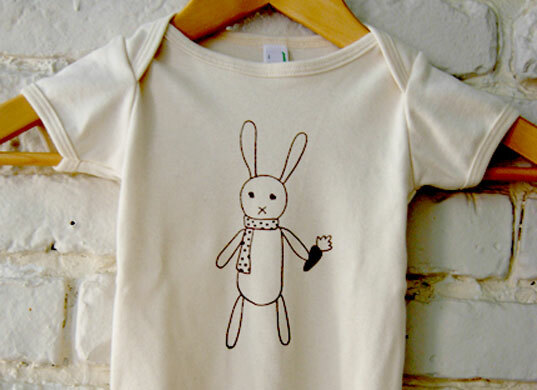 Eco-conscious designer Natsumi Nishizumi's onesies, hats and tees feature simplistically sweet bunny drawings appropriate for Easter or anytime. Each piece in the collection starts with the blank canvas of an American Apparel organic cotton basic. Then Natsumi uses water-based ink to hand-screen print her art. Another plus: 5% of the profits go toward an organization that helps provide medical care to Cambodia's children.